Dark matter is one of the big mysteries of modern cosmology. We have lots of evidence to support its existence, but the enigmatic, invisible stuff has been notoriously resistant to direct detection. Because of this, there have been lots of ideas about just what dark matter might be made of, and just how such particles might be detected. One of these ideas focuses on particles known as axions, but recent work has eliminated at least some versions of axions as a dark matter candidate. Axions are a theoretical particle devised in the 1970s to address certain issues in quantum chromodynamics (a theory that describes the behavior of the strong force). According to the model, axions would be low mass, chargeless particles that don’t interact strongly with light, which sounds like a perfect dark matter candidate. While there have been attempts to observe the effect of axions, they haven’t been successful. New work in Physical Review Letters not only didn’t find evidence of axions, it places strong constraints on their existence. Although axions don’t interact strongly with light, they can interact in subtle ways. By coupling with magnetic fields axions could decay into light, and they could also absorb gamma rays. So a team of astronomers combed through six years of gamma ray data from a galaxy known as Perseus A. The central region of this galaxy not only emits strong gamma rays, the region is known to have magnetic fields. 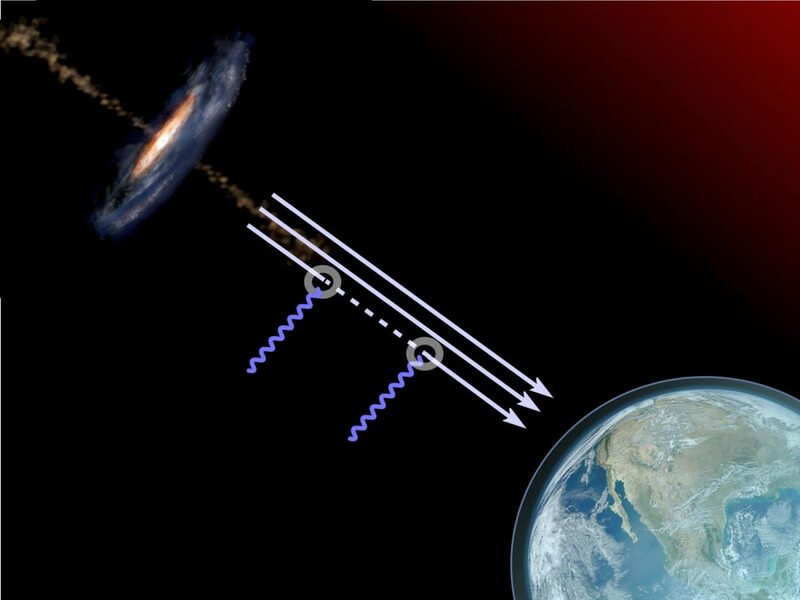 If dark-matter axions exist, they should interact with the gamma rays, changing the spectrum from Perseus A. But the team found no evidence of any change in the spectrum. The results aren’t strong enough to rule out the existence of axions, but it is strong enough to rule them out as a source of dark matter. So dark matter is still a mystery. We now have a better idea of what dark matter isn’t, but that still doesn’t tell us what it is. “We have lots of evidence to support (dark matter’s) existence ….” Really? Isn’t that evidence indirect at best, and doesn’t it really just amount to its theoretical value for explaining other data and evidence we *CAN* directly detect but is anomalous under relativity and quantum theories? And isn’t the same true of ‘dark energy’? While the evidence is indirect, there is a confluence of evidence from a variety of experiments that support dark matter. It is similar to the indirect evidence we had of gravitational waves until their direct detection. No. We actually know quite a bit about dark matter. We don’t know what its constituents are, but its existence has been all but completely verified using several independent methods. For example, an experiment was done in either 2004 or 2006 (can’t remember exactly) that observed two merging galaxy clusters. A phenomenon regarding galaxy clusters is that they contain a hot plasma within them, so when they collide, the plasma clouds collide as if they are two solid objects colliding within a fluid. At the same time though, the galaxies themselves do not collide with one another due to their vast separation distances. Using gravitational lensing effects, physicists were able to map the contour lines of where the gravity was the strongest. If dark matter did not exist, the contours would have centered themselves on the plasma clouds as that is where the majority of the mass would be found. However, since dark matter does exist, the contour lines centered outside of the plasma clouds near the galaxies. which is exactly what one would expect. Not sure how familiar you are with axion dark matter. The authors in the paper report on axion-like-particles – those having masses three or more orders of magnitude lower mass than axions that would play a meaningful role in dark matter cosmology. The only experiment in the world sensitive to a dark matter axion is ADMX http://depts.washington.edu/admx/index.shtml which is still exploring viable parameter space.